How to View Your Password Saved in Microsoft Edge in Windows 10? Have you saved your password for Facebook, Gmail, Reddit and other email clients or any other website while logging in using Microsoft Edge? Well, you can view all your saved passwords from Microsoft credential manager. Not sure how to do it? Here is a simple guide showing you the way. Microsoft Edge is the new browser and many of the one things, which was introduced by Microsoft in Windows 10 to the users. The browser works perfectly fine and doesn’t consume too much of memory unlike some of the most popular browsers, that may be because it doesn’t offer all the features offered by other browsers including plugin support (partially) as of now. Apart from occasional can’t reach web page messages, the Microsoft Edge has been working fine for me. Now, when you visit any web page or website, which requires password or credentials Microsoft Edge prompts to you to save the password with a message stating “Would like to save your password for Facebook.” If you click on Yes, the password will be saved and stored on your PC, and you can log in to that website again without requiring to enter the password and username all again. If Microsoft Edge does not ask you to save your password while logging in then, you might have turned off the “offer to save password” feature in the settings. 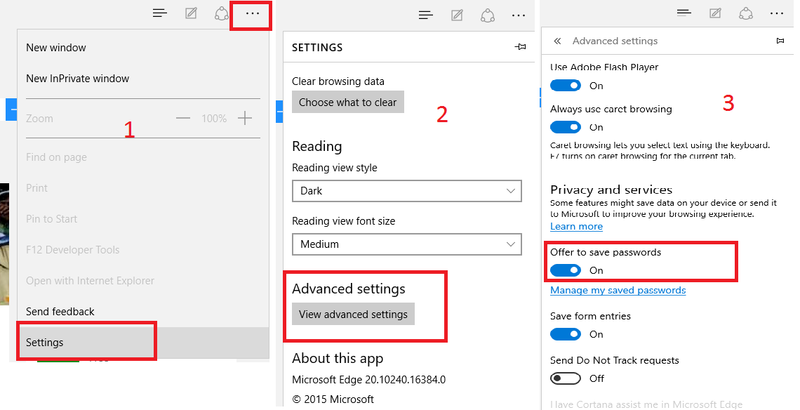 To enable this, open Microsoft Edge, click on More actions (three dots at the top right corner) and select “Settings” from the options. Scroll down and click on “View Advanced Settings.” Scroll down to the “Privacy and Services” section. Below that toggle the “offer to save passwords” switch to “On”. This way Microsoft Edge will remember your saved password. Saving the password is recommended only if you are the single user using the PC. Nevertheless, now if you want to view the password that you have saved in Microsoft Edge browser in Windows 10, you can view it in Credential Manager in Control Panel. 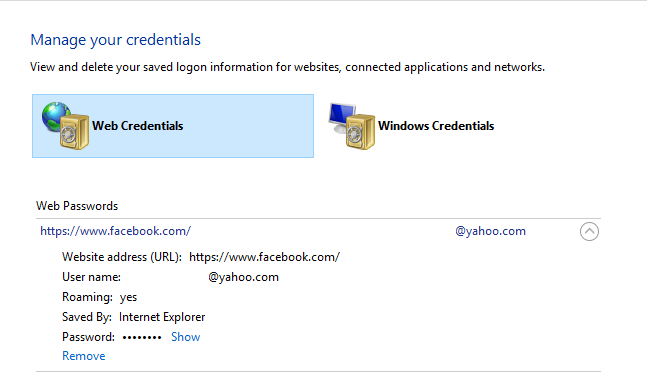 Microsoft Credential Manager under Control panel saves your web credentials and Windows credentials. The Web Credential as the name indicates stores your web credential details, like username, password, the URL and the web browser on which it has been saved. The Windows Credential stores your system credentials like administrator account details, your internet or WiFi details, etc. You can also add credentials related to other activities and save it. Now to view your username and password saved in Microsoft Edge in Windows, you should look into “Web Credential Manager”. So, here is how to do it. How to View Your Username Password Saved in Microsoft Edge in Windows 10. Open Control Panel on your PC. To do this, press Windows Key + R, type in “Control Panel” and hit enter. Alternatively, you can also access it from Sart, type Control Panel and open Control Panel by clicking on the icon. From Control Panel, click on User Accounts. Next, click on Credential Manager and then select Web Credential tab. Under Web Credential section, you should see all your saved password and username are listed under web password section. You can identify which password belongs to which account by looking at the URL of the website to which the credential belongs. Click on the small down arrow icon, which you can see beside your website URL to expand the section. Your password will be hidden as *****, but you can view them by clicking on “Show” link beside the password. When you click on Show link, you will be prompted to enter the current user account password for your PC to verify the ownership. Enter your password and click on OK. This is required to prevent unauthorized users from viewing password saved on your PC. If you have entered correct user account password, you can view the password for the selected web account. Click on Hide to hide the password again. If you don’t want to keep that credential (username and password) saved on your PC, then you can remove the saved the password by clicking on Remove at the bottom. When you click on Remove, you will be prompted to confirm the decision click Yes to confirm and delete the saved credentials (username and password). Now if you visit that website again, you will be asked to enter the password again, as you have already deleted them. Just make sure that when asked whether you want to save the password for that website, click on NO button. So, that the credentials are not saved again. Now if you think the above-mentioned steps are unnecessary or just too much to manage the saved password, then you can manage password in Microsoft Edge from the settings. What’s the catch? Well, from here you cannot view the saved password, but can only make changes to them by editing the password or email ID. Perhaps it is because I am NOT a genius like you guys, but it is unbelievable to me that geniuses like you cannot figure out how to see passwords worthless Edge has stored. SOMEONE knows how to retrieve them. Many are stored, but they are apparently encrypted. I cannot see them, nor do they plug themselves in when I go to one of the sites for which they are saved. I do not want to change them. Edge is trash, and MS is evil. Did you try the steps mentioned in the article? You cannot view saved passwords directly from the edge, but you can view them from the password manager from Control Panel\User Accounts\Credential Manager and click the Web Credential tab. Great article. Sadly for me it didn’t help to solve my problem. I forgotten my user account password, so i couldn’t see my password. Then i found a simpel and totaly free solution for my problem. 1. I downloaded and installed the Firefox web browser. 2. Then i imported the data (bookmarks, password etc.) from the edge browser. 3. And then in the Firefox browser, go to the menu, security tab and click on saved logins. And bingo!! I was able to recover my lost password!! I hope i helped somebody with this solution. Thanks for the tip.Will be helpful for someone in similar situations. No you cannot. The only passwords showing up under Web Credentials are passwords I saved previously under google. The sites listed under Microsoft edge settings are NOT listed under the web credentials. Also really stupid that you cannot see the freaking passwords. I wouldn’t be going there to look if I knew what it was already. HATE edge. Thank you! I successfully retrieved my email password lost when switching phones. Good article.I am using Lumia 540.i use Microsoft edge for browsing.i have an option like “manage my passwords”.well I have my passwords in that…but how do I view it..it’s really important..is there anyway man???? I have a question: do you know if it’s possible to force Edge to never remember passwords in a way that the user cannot enable password remembering again? maybe as an administrator but so it forces all accounts on the computer to never remember password… I’d really love a way to do that for our public computers! An InPrivate session should ensure that passwords aren’t stored. After accepting my Microsoft online password, credential manager closes and shows desktop instead of unmasked passwords. This was kinda helpful… but not fully. When i got my brand new computer it never asked to save my youtube account or gmail account when i logged in the first time. Yet somehow twitter saved and was the only one to do so… my question is. How do i force the computer to save the passwords it missed? Like someone above, I could not resolve my problem with this tutorial. I needed to find the username and password to my Edge account which I thought were the same as the log in details to my computer. Is it? Don’t know. So as I could not find those under Web Credentials, I am back to square one. It would be most helpful to resolve this without having to download another internet browser but I may have to. I have no idea what my computer credentials are, but I was able to use face recognition to access my passwords in Credential Manager. Thank you for the help. Your computer credentials are the username and password that you use to login to your computer. 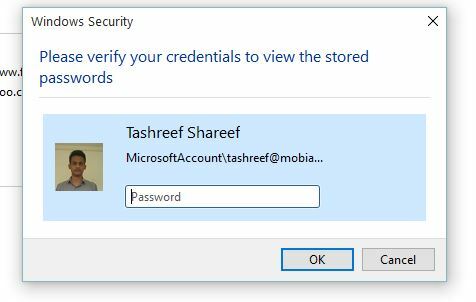 In EDGE save Password credential file……….. IS there a limit of line items / # of passwords allowed . Previous using Explorer IE I was could only view / locate the first page …….seemed to limit line entries ??? Does that same thing happen using EDGE……………..only allows say 12 saved passwords for websites??? Hi Dianne, I am able to use the print function when the password page is open. I am not sure, why it is not working for you. Tonight I read the tutorial and advanced farther in 10 minutes than I did all day. Very nicely done! I am in your debt. Hi, is there yet another place where Edge stores passwords? Apparently I accidently told Edge to save my psw and how it automatically logs into my Exchange, but I can’t seem to find how to remove the stored psw… It doesn’t show in the place mentioned above (Settings/manage psw nor WebCredentials). With other webbrowsers I have to give the psw, so it is not stored in Exchange but somewhere in Edge. Love your advice T.Y. sooooooo much now I can stop pulling out my hair, what little I have left LOL you saved me a lot of sleepless night’s THANKS AGAIN SO MUCH!!!! Most posts are fairly helpful, if you can access Edge, i can’t! Won’t accept any password, tried all my old ones and if i change my password won’t accept that either! Basically means i am locked out of my laptop.